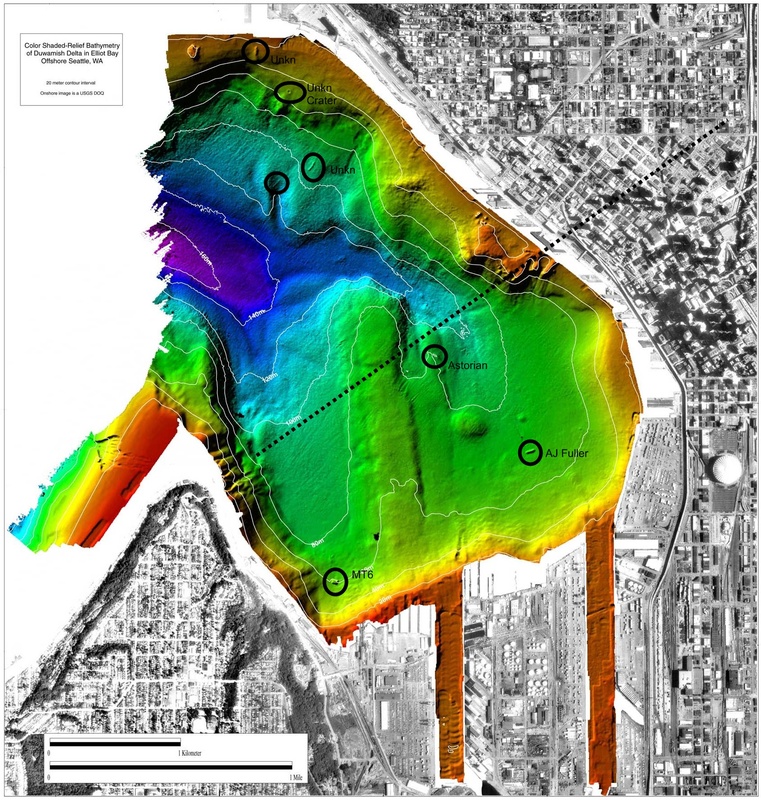 After the February 2001 earthquake in Seattle, NOAA and the USGS teamed up in a project to map the underwater geology of the Duwamish River delta (Elliot Bay, Seattle), the Puyallup River Delta (Commencement Bay, Tacoma) and the Nisqually River delta. The multi-beam images they created are really interesting. The dotted line across the image is the major fault line that runs under the bay and then up through downtown Seattle. The sharp ridges you see on the west side of the dotted line are very pronounced faults – I have seen them with my own eyes on prior dives in this area. But until this image was created I had never known where they connected on the other side of the bay. Turns out they line up pretty well with Pike and Pine streets in downtown Seattle. When the ‘big one’ happens, it is going to be devastating. Two of the circles on the north end of the image highlight some pretty big shipwrecks, both of which are in more than 300 feet of water. Date of sinking, names of the ships, etc all unknown. I’ve also circled a crater which looks very large. 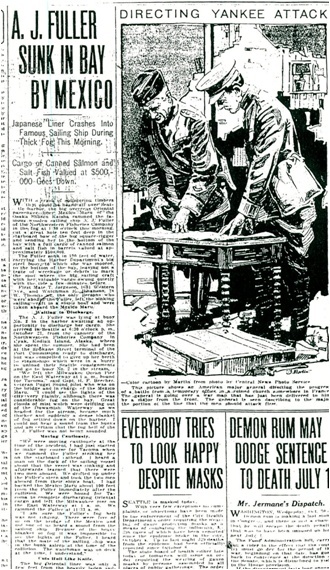 It seems it was likely caused by a significant amount of ordinance – maybe during WWII. I also circled in the NW corder of the bay what appears to be an unexplored wreck in shallow water. The circles on the south end of the image are of three wrecks I have written about on this website, the MT6, the AJ Fuller & the Astorian. Made another dive on the AJ Fuller today – but this one ended up being a pretty short event. There were four divers including myself and we were broken into two teams. We descended to the bottom in about 3 minutes, but this time the shot ball from our descent line was sitting on the wreck, so our bottom depth was 220ft. The first team had already tied in a reel to the line and were out in front of us by a couple minutes. My partner and I were running parallel to each other and on opposite sides of their line. We made our way from the center of the ship to the outside beam. On reaching the outside beam of the Fuller, I looked over to see my partner’s scooter doing its best to drag him over the edge of the ship. Its main compartment seal had failed and the scooter was completely flooded – this made the scooter weigh a good 50lbs. Having a 50 pound negative weight attached to you isn’t a great way to make your way around at 220ft, so we thumbed the dive and headed for home. Just before our ascent my buddy unclipped his scooter and tied it in to our up line so as not to have to deal with the negative weight. By the 25 minute mark we were back at the surface for a dive that normally has a run time closer to 90minutes. The visibility was so bad on the bottom the other team, one of which was shooting video, called their dive short as well. With the total amount of gear we take along for a dive like this, there are lots of opportunities for problems. So when things do go wrong we just learn to deal with it. The AJ Fuller isn’t going anywhere soon, so the only thing you can do is take it in stride. I made a dive on the AJ Fuller with SCRET.org today. 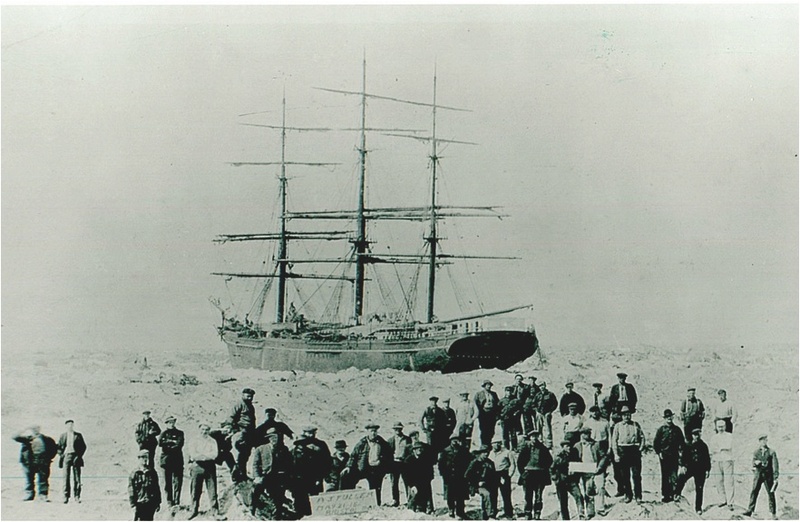 The Fuller is a massive 229 foot long, three mast sailing ship that sunk in 1918. The AJ was owned primarily by Flint & Company of New York, and named for a shareholder who lived in Bath, Maine. 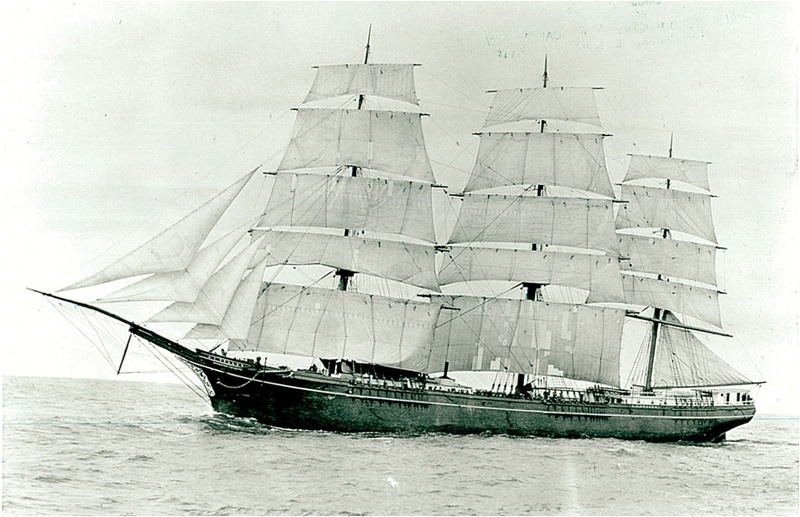 The three-skysail yard ship was one of a dozen ‘Down Easters’ built in 1881. Under the Flint house flag she sailed between New York, San Francisco, and Liverpool for ten years. 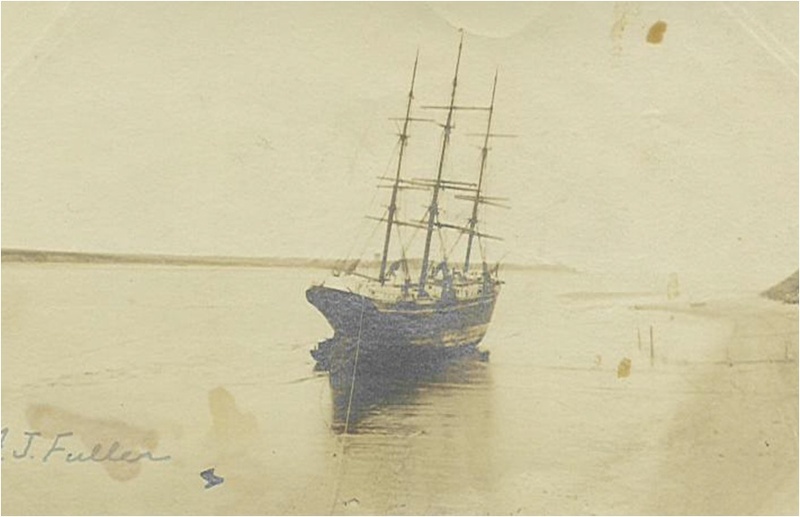 In 1892, she was put in trade from East Coast ports, where she loaded case oil for the ‘Orient’ or general cargo or coal to Hawaii, generally returning with sugar cane. It was while she was in that trade that Felix Riesenberg, who later became a master mariner in his own right, sailed in her before the mast. 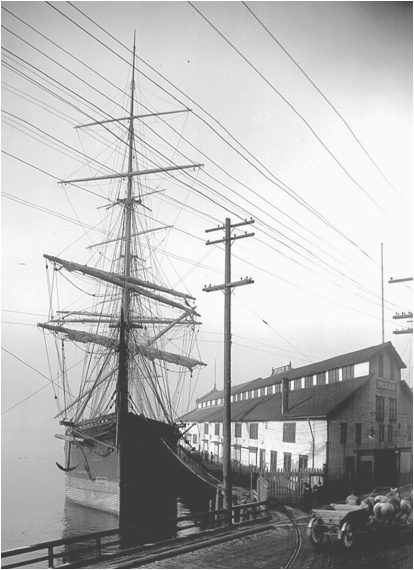 She was sold to the California Shipping Company in 1902 and used in trade between the Pacific Northwest and Australia, exporting lumber and importing coal. 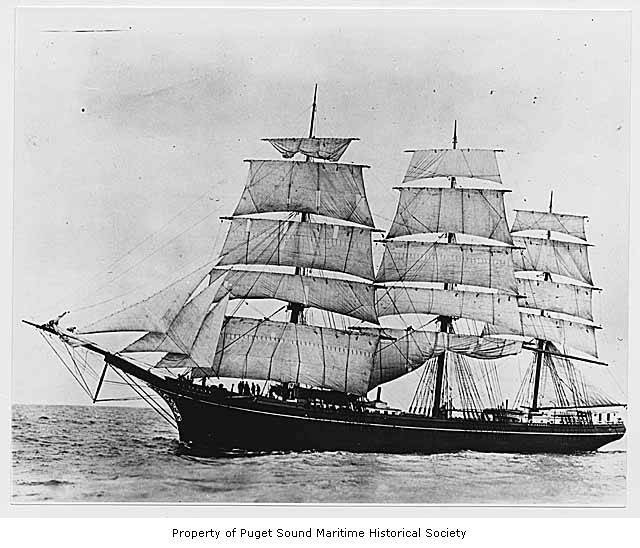 In 1912, she was purchased by the Northwestern Fisheries Company of San Francisco, who employed her in their seasonal salmon fisheries—sailing north in the spring with fishermen, cannery workers, and supplies, and returning in the fall with a full load of canned salmon. On October 18, 1918, while inward bound to Seattle in a heavy fog, she was rammed by the Japanese steamship Mexico Maru and sank in about 240 feet of water. I was on a team of three divers and there was one other team of two. Our team was first in the water, which meant once on the bottom it was our job to locate the wreck. We thought we dropped the anchor ball and buoy line right on top of the wreck – or we at least hoped that was the case. The visibility was incredibly great on the way down. I really thought there was a chance we would encounter the same viz on the bottom, but we weren’t so lucky. Around 170 feet it clouded up pretty badly and stayed that way the rest of the way down. Since the wreck rises about 20 feet off the bottom, we expected to encounter the Fuller on our decent at a depth of about 220ft. But we went right past 220ft and found ourselves hovering above the Puget Sound’s floor in 248 feet of water. That is the deepest I have ever been. We tied in a cave reel to the anchor ball and buoy line and set off looking for the Fuller. With only 2-3 feet of visibility it took us 5 minutes to find a wreck that was really within 20ft of where our anchor ball hit the ocean floor. Once on the wreck we encountered plenty of life. Lots and lots of big shrimp – some big lingcod too that startled off so quickly they made the already bad visibility worse. We were on scooters, with the lead diver running our cave line and the other diver shooting video. I was in the number two position making sure the diver running cave line didn’t encounter any problems with that line. Cave line has a way of being evil at depth. 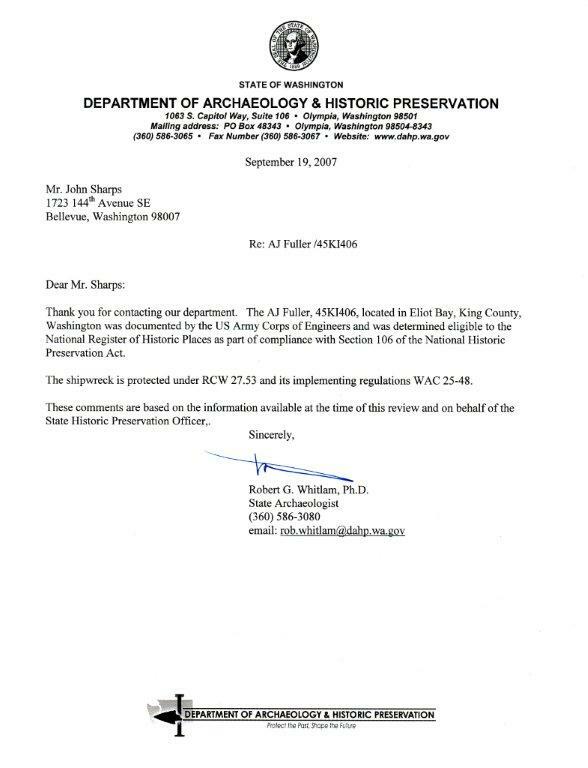 We passed over China plates and tea cups, errant old bottles etc., but since this wreck is one of only two wrecks on the list of Washington’s historical sites we left what we saw undisturbed. At 20 minutes into the dive we ran out of line on the cave reel. That meant we had covered around 400feet. We cut the line and I tied it off. Then we stayed on the scooter triggers back to our up line. We started the ascent at 25 minutes. Decompression was uneventful, though long. It took around 65 minutes to step our way back to the surface. So we bailed on the AJ Fuller and moved from the East Channel entrance to the West Channel entrance for a dive on the M.T. No 6. We don’t know a lot about the MT6, other than it was a train ferry converted to a barge and that it sunk on December 31st, 1949. NOAA took a side scan of this one some years ago and the target location is visible on most NOAA maps of Elliot Bay. It is also visible in the multi-beam image of Elliot Bay that I have posted on this website. The depth of the wreck and our dive was 220ft. We spent 25 minutes on the bottom, about 10 minutes getting up to our first gas switch and then 50 minutes in a stepped decompression to the surface. Because of a tidal flow that occurs at depth on this wreck we brought scooters – and because of the depth and the time we would spend on the bottom we brought both 50% oxygen and pure oxygen for decompression gas. There was lots of life on the wreck, saw one ling cod that must have weighed 60 lbs. We tied in to our drop line with a reel of cave line, and then ran a full loop around the wreck which turned out to be around 400ft (wreck is 150ft long by 50ft wide). It’s a big wreck to see and by the end of our 25 minute dive we felt like we had just scratched the surface of it. This Saturday I’m going out with the normal crew to make a dive on the AJ Fuller – a massive 229 foot long, three mast sailing ship that sunk in 1918. She is sitting at the bottom of Elliot Bay, 240 feet deep, so I consider this dive to be a “big dive” if that makes sense. The AJ was owned primarily by Flint & Company of New York, and named for a shareholder who lived in Bath, Maine. 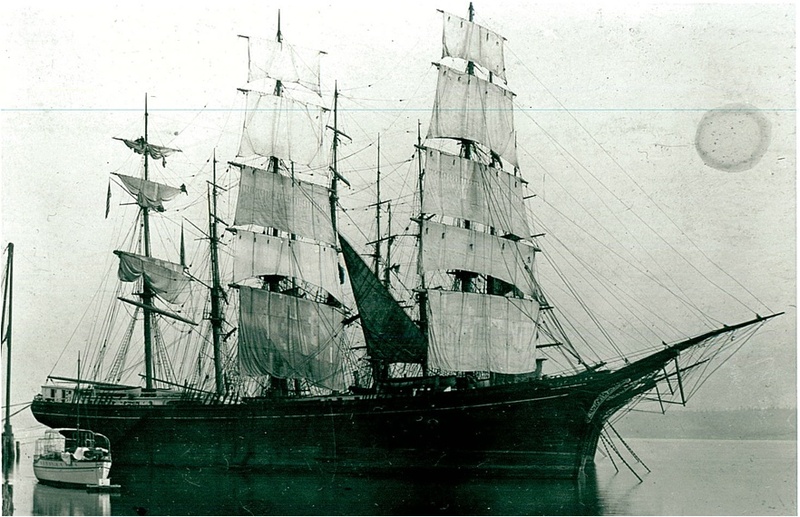 The three-skysail yard ship was one of a dozen ‘Down Easters’ built in 1881. Under the Flint house flag she sailed between New York, San Francisco, and Liverpool for ten years. On October 18, 1918, while inward bound to Seattle in a heavy fog, she was rammed by the Japanese steamship Mexico Maru and sank in 240 feet of water.